I recently spent a week in New York City helping my girlfriend Pat pack up her apartment, a studio on the tenth floor of a grand old building overlooking Gramercy Park. Rare and remarkable are two words for Gramercy Park, secluded within the heart of this electric city. Four short blocks of mid-rise brownstones surround the gated haven full of shade trees and flowering plants. No major streets, no rumbling traffic, no Lexington or Madison avenues barreling through. It’s a neighborhood that still feels like old New York. Pat’s building, constructed in 1909, is unique to the square; the facade of the 12 story landmark is white terra cotta, Gothic in design, with ornate detailing. 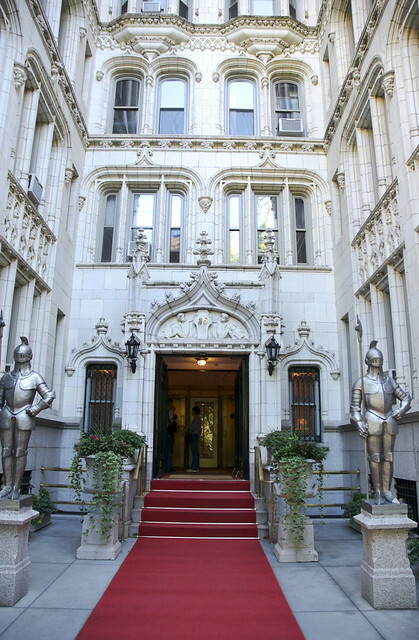 At the entry stands a smiling doorman in dapper uniform to greet you; inside is a gilt vestibule with a reception and two narrow elevators. Step inside those gleaming brass doors for a lift up to 10T. Pat’s apartment measures right at 330 square feet. Yes, it’s small. Basically a room and a bath. Tall ceilings, wide windows, minimal furnishings, and a couple of strategic angles that trick the eye into thinking there is something more around the corner all combine to give it a more spacious feel. When you are out in the frenetic thrum that is Manhattan, a nest such as hers is the ideal respite–all you need, really. Over the years, I have enjoyed staying in its cozy quarters. Change happens. And one begets another. Last fall, Pat’s husband died. She quit her high-powered job of many years. Then, she got an unsolicited—and generous—offer for her apartment. The end of a cycle. The closing of a life chapter. When I learned that Pat was selling this special place, I wanted to be there to help close things out, say good-bye. It wouldn’t take the whole week to pack. We wanted to relish the final days at The Palace, and soak up as much of the city, from the perspective of being a resident rather than a visitor. As someone who was born in New York (Queens) there is always a part of me that yearns for time there. Partly to reconnect with the place, and its magnificent and gritty sense of place. The city is potent with memory—each visit serves to recall visits gone by while creating new experiences. Making memories. This time, I got a good dose. We went to museums: MOMA and the new Whitney. We strolled the Highline. We met friends for drinks in different neighborhoods. We ate at some wonderful restaurants. I also did some cooking. Union Square, with its open air Green Market (open 4 days a week!) is an easy walk from the apartment. From an array of vendors, I purchased heirloom tomatoes, peppers, zucchini, corn, basil and melon. Walk a bit further south, and you’re in Little Italy. Pat’s sister Lynn and I jaunted over to Alleva Dairy, the oldest Italian cheese store in the city—and the United States. Lynn bought sausages and I got pasta and a ball of luscious burrata. It was fun to cook in the tiny kitchen and dine on a fresh summer feast. Bittersweet. A last supper, to be sure. Are other New York adventures still to come? No telling when, but I feel certain they will. Place a large pot of salted water on medium high heat and bring to a boil. Trim the zucchini ends and slice it lengthwise into thin slabs. Take each slab and slice it into long thin julienne strips. Cook the linguine according to package directions. (about 10 minutes) Drain and set aside. Return the pot to the stovetop. Set the heat on medium and add olive oil–about 3 tablespoons. Add the zucchini. Sprinkle with salt and black pepper and saute for 2 minutes—so that the zucchini becomes pliable. Stir in the linguine. Toss until the two are entangled. Ladle the red sauce into each bowl. Top with the pasta. Garnish with grated pecorino-romano and toasted pine nuts. Place red bell pepper and tomato halves onto a baking sheet. Tuck onion pieces and garlic cloves underneath the peppers. Brush the tops with olive oil. Roast in a preheated 425 degree oven for 25 minutes until the skins of the peppers and tomatoes are blackened and blistered. Place cut watermelon, peaches, jalapeno and basil into a large bowl. Pour lime juice and olive oil over the salad. Gently toss. Place the round of burrata in the center of the salad. Drizzle a little more oil over it. Season with salt and black pepper. When serving, break into the burrata so that shreds and the creamy inside become mixed with the fruits. Puttering in the garden. A dip in the pool. A day trip to the country. Stirring a pot of blackberry jam. Tomatoes, and more tomatoes, at every meal. That’s the summer in my mind. I’ve caught glimpses of that idyllic summer, even taken the occasional dip and day trip. For the most part, that slow carefree pace has eluded me. It’s not a complaint, don’t get me wrong. In the life of a food writer-educator-recovered caterer-grandmother, you gotta roll with whatever assignments come your way! From cooking camps to grandson care, life has been full. But, here I am. And, I have hopes for a languid August. Beautiful produce is coming into the markets; look at that bounty. I haven’t stopped cooking. Here are a few summer dishes I’ve enjoyed. Have your heard of Juliet tomatoes? They are a paste variety that look like mini-romas. I really like them for certain applications. Thick sauces. Salsa. Ketchup. And, they slow-roast into meaty ovals of sweetness. I used them, in their slow roasted state, to make this frittata. The process started on the stovetop in my cast iron skillet, and finished in the oven. A frittata is a fast and versatile recipe to have in your repertoire. You can find numerous variations here. I served this for an impromptu brunch for friends–it couldn’t have been simpler, and more satisfying. Coat a 9 inch cast iron (or oven safe) skillet with butter. Beat eggs, cream, salt and black pepper together until no traces of yolk can be seen. Add the tomatoes, dollops of pesto and shredded cheese. Cook on the stovetop for about 5-7 minutes. Place the skillet into the oven to finish—about 15 minutes. One of the teen cooking camps I taught at the food bank was all about “Street Eats.” We explored cuisines around the world, from the standpoint of what you’d buy from a street vendor, pushcart, food truck: some times the most delicious dishes ever! One day, we made Mexican fare—grilled fish tacos, pickled cabbage, churros dusted with cinnamon sugar, and elotes—those spectacular ears of grilled corn slathered with lime-and-chili spiked mayo. We had a few extra charred ears which I brought home. They soon wound up in this salad that celebrates summer yellows: wax beans, sweet bell pepper, onion, sungold tomatoes and crookneck squash. I blanched the beans (fresh picked from a friend’s garden!) in water seasoned with garlic and bay leaf. I sauteed the peppers, onion and squash. I scraped the grilled and slathered kernels off the cob, and mixed the whole she-bang together. Finished with a scatter of sungolds, cilantro, and a squeeze of lime. Mercy. Summer in a bowl. It was so so good. Fill a skillet with water and place over medium heat. Add the garlic, bay leaf and 1/4 teaspoon salt. Bring to a boil. Cook the wax beans ( a few at a time–do not crowd) until tender-crisp–about 4 minutes. Remove and let cool. Empty the skillet, dry it, and place over medium heat. Add olive oil. Add the squash, peppers and onions. Saute for about 4-5 minutes. Remove from heat. In a large bowl, place the wax beans and sauteed vegetables. Scrape the corn kernels into the bowl. Add the sungold tomatoes, cilantro, and Elote dressing. Toss well and serve. What do you do when you have a ripe mango, a pint of blueberries, a container of plain Greek yogurt and a lime? This is the answer. Easy-Pretty-Tasty-Healthy. This one is barely a recipe. Place the yogurt into a bowl. Add lime juice, zest and honey. Stir until well combined. Taste and adjust for sweetness, if desired. Set up 4 glasses (or whatever serving vessels you’d prefer.) Place a dollop of yoghurt in the bottom of each. Follow with a handful of berries, a few slices of mango, and repeat the layering until the glass is full. Garnish with basil or mint leaves and serve. grown in his meticulous urban backyard garden. Sleek and delicate, just picked and crunchy sweet. The sack still holding the day’s warmth. A summer highlight that had gone missing for a couple of summers. Two years ago, Ray’s crop did too poorly. Pests and such. Last year, I was out-of-pocket. Book promotions and such. But this year, they’re back. And I’m back. Thank goodness. As I’ve done in productive summers past, I’ve created a dish to celebrate them. This time, I gleaned inspiration from a favorite local chef, Roderick Bailey of The Silly Goose, who makes a bowl of green beans and yukon gold potatoes, nestled in a pool of hazelnut romesco sauce. He finishes the dish with shavings of Manchego cheese and a flourish of paprika oil, in Spanish tapas fashion. Now, in my pantry and fridge I had many of the ingredients to replicate. Those golden potatoes, buttery companion to the beans. I had cremini mushrooms to add to the mix, impart their own kind of meaty umami. As for the romesco, I had ripe bell peppers. An anaheim too, for a mild kick of heat. A couple of tomatoes. Half an onion. A piece of shallot. The critical sherry vinegar. A few missing elements, though. No hazelnuts, nor Manchego cheese. No paprika oil, either. No matter. I could still achieve a luscious base for the dish. A simpler romesco. I even eliminated the soft breadcrumbs often used as a thickening agent in traditional preparations. Let’s keep it gluten free. The peppers, once roasted and pureed with a splash of vinegar, a teaspoon of paprika, would have rich body and deep flavor. It all comes together with minimal work. Blanche the slender green beauties–done in just minutes. Roast potatoes and mushrooms. Roast, then puree peppers, tomatoes, onions and the like. Pool and spread the romesco. Arrange the vegetables; let them settle into the sauce. Stand back and admire the brilliant composition of colors and textures. For other ideas for preparing and serving romesco sauce, visit here. Bring a large skillet of lightly salted water to a boil. Put in the beans and cook for 3 minutes. Plunge them into an icy bath to cease the cooking and set their bright green color. Drain and set aside. Place the cubed potatoes onto a baking sheet. Sprinkle with 1 tablespoon olive oil, salt and black pepper. Toss to coat. Place quartered mushrooms onto a baking sheet. Sprinkle with 1 tablespoon olive oil, salt and black pepper. Toss to coat. Place each pan into the oven and roast until the potatoes are crisp and lightly browned, yet have soft cooked interiors—about 20 minutes. The mushrooms will roast more quickly, about 15 minutes. Set both aside and make the romesco sauce. Place peppers, onion, garlic, tomatoes onto a baking sheet. Coat with olive oil and dust with salt. Roast in the preheated 425 degree oven until the skins of the peppers are blistered—about 20 minutes. Remove and cool. Peel and discard the skins of the peppers and tomatoes. Place the vegetables into the bowl of a food processor fitted with a steel blade. Add the sherry vinegar and paprika. Pulse and process until smooth. Taste for seasonings and adjust as needed. Pour most of the romesco sauce onto the bottom of a shallow bowl. Toss the green beans, potatoes and mushrooms together. Place on top of the pool of romesco. Dot the vegetables with remaining sauce and serve. Note: This is delicious served warm or room temperature. Enjoy! I had forgotten how it is, when I travel by car for any length of time. In mere days, the rhythm of the road takes over as the rhythm of life, marked off in mile posts and fuel stops, Best Western Motels and Starbucks coffees, paced by the hospitality of friends and family along the way. Thoughts and cares of my own home fade. What is present becomes my focus–the endless flat stretches of highway through Kansas prairie, the shifting views of snow-capped Rockies in mist, the blue skies over Utah, wide and deep, dotted with lolling cotton clouds, the pink and white oleanders, heavy in bloom, spilling over the median on the California freeway. Driving away from the day-to-day takes you to new places in the mind. For me, it brings up the curious mix of lives not claimed, and yet, the pervasive connection of all life. And then there’s the wonder of connection. My cousins and I see one other rarely, and yet the warm familial love doesn’t care about the years. It time jumps. Hanging out in the kitchen, making food for the book event, talking and laughing…we’ve never been apart. Here’s another one: On the morning of the book signing, my cousin Jeanne got an email from a woman named Nancy H. Turns out she used to play bridge with my aunt, AND she is a long-time follower of my blog. It wasn’t until she read my last post with the invitation that she made the connection. She came to book signing, and we got to meet. How amazing is that? That theme continued on our journey. In Berkeley, a friend from high school days–again someone I’ve seen little of over 40 years– helped me get ready for the signing at Pegasus Books. We shopped at the Berkeley Bowl together. I made Cornbread Panzanella in her kitchen. And, at the Pegasus signing itself: Gerlinde of Sunny Cove Chef took the sweet notion to drive up from Santa Cruz to attend. We’ve virtually met through our blogs, now we’ve really met. The power of the web. The power of connections. Five thousand miles, and we’re back home. Bill and I thought that everything looked fine, but felt different. We wandered from room to room, detached from our place. We’d taken up the gypsy life and hadn’t switched back into our old and familiar ways. There’s nothing like preparing a meal in your own kitchen, sharing it with friends, to get you grounded. I’m getting there. For today’s dish, I rummaged the fridge and pantry—found viable potatoes, beets,and green onions…green peas in the freezer. I snipped arugula and thyme from the yard. It was kind of a throw-together, but it worked. Roasting the veggies, coating them in mustardy sweet-sour marinade, pulsing tangy arugula into the vinaigrette combined to make a delicious late spring salad. Preheat the oven to 425 degrees. On one sheet pan, place the sliced potatoes. Pour about 1/4 cup oil over the slices, and toss to coat. Sprinkle with salt and black pepper. Roast for 20-25 minutes, until golden brown. One another sheet pan lined with foil or parchment, place the beets. Coat with olive oil, sprinkle with salt, and place into the preheated 425 degree oven to roast for 25-30 minutes. Place the peas into a saucepan. Add 1/4 cup water and bring to a simmer on low heat, cooking the peas until tender, but still with bright green pop. Remove from heat, drain and cool. Chop two greens onions and pick 1 teaspoon fresh thyme leaves. Stir into the peas and set aside. Remove potatoes from baking pan. Deglaze the pan with 1/4 cup white balsamic vinegar and 2 tablespoons coarse grain mustard. Stir up any crusty bits into the sauce. Pour over the potatoes. Remove the beets and allow to cool. Peel and slice into rounds. Splash with 1 tablespoon vinegar and set aside. In a food processor fitted with the steel blade, place 3 tablespoons white balsamic vinegar, 1 tablespoon coarse grain mustard, 3 chopped green onions, 1 tablespoon fresh thyme, and 1 cup arugula leaves. Pulse until chopped together, then process, pouring in the 1/2 cup olive oil, a little at a time. Place a bed of arugula onto the base of the salad bowl. Place a ring of marinated potato slices, followed by a ring of sliced pickled beets, finished with a mound of peas. Dot the salad with little pours of the green vinaigrette. Sprinkle bacon bits over the salad if desired.